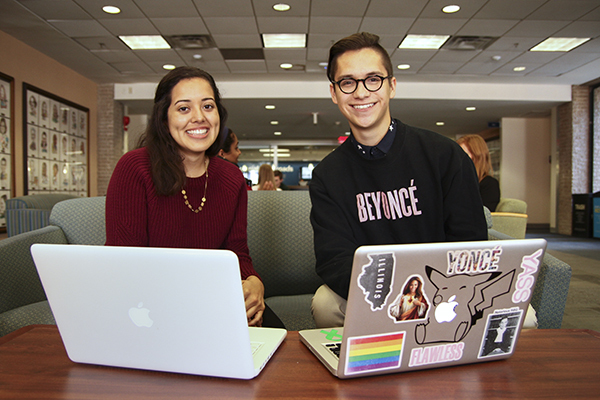 Junior Gabriela Madrid, left, and senior Miguel Mejia are both first-generation college students. They're starting a student organization to support other students who are the first in their families to go to college. A new student group aims to help other students who are the first in their families to attend college. Two GW students, who hope to be the first members of their families to earn a college degree, are creating a new student organization to help other first-generation college students graduate from GW. They say while GW offers resources to those kinds of students, the possibility of their success could be boosted by having a group of fellow students in the same situation. The students have submitted paperwork to the Center for Student Engagement to start what they say will be the first peer-led student organization that focuses on advocacy, support and financial help for first-generation students. The group does not yet have a name, but the students will begin recruiting new members next semester. First-generation college students can feel isolated in college, especially during their first semesters, the group’s founders said, adding that some students face pressure to financially support their families while they’re still in school. Professors in the Columbian College of Arts and Sciences launched a mentorship program for first-generation freshmen three years ago. Two years ago, GW eliminated a peer-mentorship program for all freshmen in favor of focusing on specific groups of incoming freshmen, like first-generation students. Mejia said that when he applied to college, he had to guide himself through the process because nobody in his family had gone through it before. They have outlined a five-year plan for the group that includes eventually creating a fund for students for smaller expenses like Metro rides to travel to internships. For now, the group is hosting monthly dinners that attracted about 40 students in October, Mejia said. Gabriela Madrid, a junior and a founding member of the group, said members of the group will be students with similar experiences who can share pieces of advice and offer guidance to students just starting college. Both Mejia and Madrid have older sisters who started college but eventually dropped out. Graduating on time is often an issue for first-generation students, who begin college but might not have the necessary support to complete the process. This year, officials want to increase GW’s retention rate, the number of students who remain at and graduate from GW. Over the last eight years, freshman classes lose roughly one-fifth of their original pool to transfers and dropouts after four years, according to GW’s Office of Institutional Research and Planning. This spring, Mejia and Madrid want to honor first-generation college students who have made it to graduation with a pin or sash. They said the mark would serve as an acknowledgment for the challenges first-generation college students most often face.